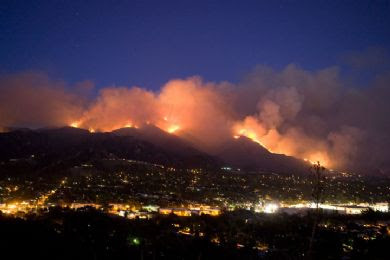 As I type this local television is reporting that the Station fire is now over 121,000 acres and containment isn't expected until September 15th! Yikes! And, we've been "lucky" so far because the winds have been calm. I shudder to think what this might have been like with Santa Ana winds! In addition, there are five other identified fires burning in Southern California and another half dozen burning throughout the state. The Los Angeles Times has a collection of breath-taking photographs from the fires. Click HERE to view them, plus excellent reader photos, too. A big tip of the hat to Kevin Roderick over at the LAObserved blog for providing outstanding coverage of the southern California fires over the weekend. While the local television outlets virtually ignored the explosion of fires on Saturday and Sunday Kevin stayed at the helm of his blog and provided excellent coverage and links. Go to his link and scroll down through the first three pages for excellent coverage and links. Two of those he provided are shown below. The first, by video producer Eric Spiegleman, gets your attention. The second, by Dan Finnerty, shows more flame. Time Lapse Test: Station Fire from Eric Spiegelman on Vimeo. Station File Time Lapse #4 from Dan Finnerty on Vimeo. COSTA MESA COUNCIL MEETING A YAWNER? Tonight's Costa Mesa City Council meeting could be a real yawner. The decision of how to proceed with the replacement for Jim Fisler on the Planning Commission may be continued until Eric Bever, who is expected to be absent tonight, is able to participate. We'll report on the proceedings tomorrow. There is one item on the agenda that might make for some interesting discussion. The council will hear from staff about the Red Light Camera program. Reading the staff report, it sure does sound like the program should be abolished and more police officers assigned to snag violators. The staff report indicates that you get more bang for your buck that way. Besides, the vendor is in receivership and doesn't appear able to complete it's contractual obligations with the city. Hot Time In The Old Town Tonight! Marc Puckett Is Gone - Why? What's Mansoor Up To Now?